Pharmaceutical Name: Fructus Ziziphi Jujubae. Common Name: Jujube, Chinese date. Part Used & Method for Pharmaceutical Preparations: The ripe fruit is gathered at the beginning of autumn and dried in the sun. 1. Weakness of the spleen and stomach manifested as lassitude, poor appetite and loose stool. 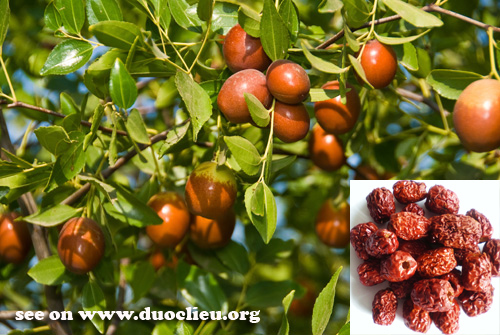 Jujube (Dazao) is used with Ginseng (Renshen) and White atractylodes (Baizhu). 2. Hysteria manifested as grief, weeping and sighing. Jujube (Dazao) is used with Licorice root (Gancao) and Light wheat (Fuxiaomai) in the formula Gan Mai Dazao Tang. 3. Moderating the action of other herbs. Jujube (Dazao) is used with Peking spurge root (Daji), Kansui root (Gansui) and Genkwa flower (Yuanhua) in the formula Shizao Tang. Preparata (Shu Di Huang) and Radix Angelicae Sinensis (Dang Gui). For insomnia and palpitations with vertigo, it is used with Radix Glycyrrhizae Uralensis (Gan Cao) and other herbs. Dosage: 3-12 g pieces, or 10-30 pieces. The herb is usually. decocted after being cut. Cautions & Contraindications: This herb is contraindicated in conditions of excessive dampness, epigastric and abdominal distension and fullness, retention of food, intestinal parasites, pain of decayed teeth and cough due to phlegm-heat.